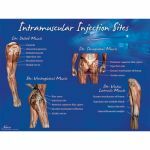 These visual aids were developed specifically for teaching, demonstrating, training, and studying of intramuscular injection site locations. The poster, chart, and front of the tablet illustrate site landmarks and muscles in the deltoid, dorsogluteal, ventrogluteal, and vastus lateralis regions. The tablet has a second side that directs procedure steps for each injection site location. The tablet contains 50 sheets and is a cost-effective handout that can be given to each student. 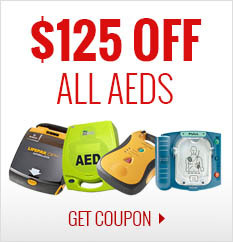 The poster and chart are laminated and perfect for mounting in a classroom or skills lab. 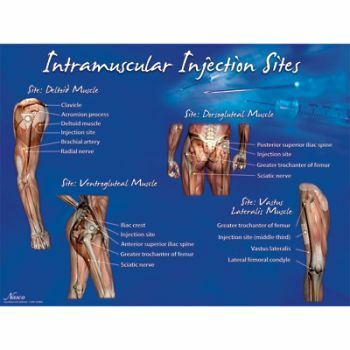 These teaching aids will enhance intramuscular injection skills teaching and training. Includes poster, chart, and tablet (right).